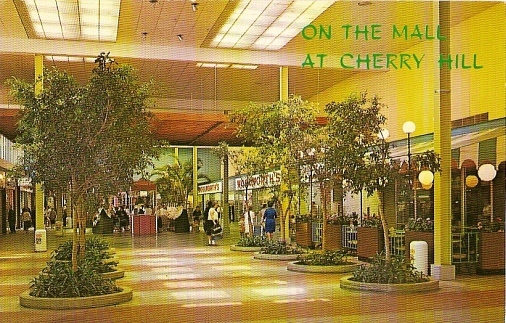 Cherry Hill Mall was the first enclosed shopping mall east of the Mississipi River and was among the first eight in the nation. 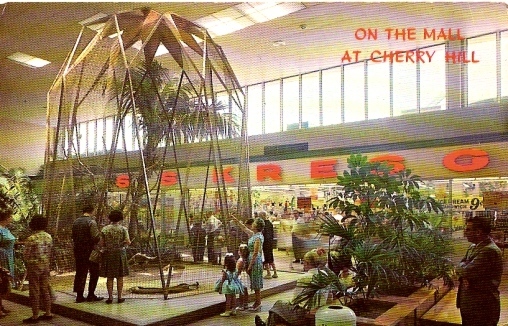 Cherry Hill Mall first opened on October 11, 1961 with a Strawbridge & Clothier Department Store, Food Fair Market, S.S. Kresge and F.W. Woolworth Variety Stores as anchors. An addition was opened in the Fall of 1962 adding a second department store - Bamberger's, and in 1978 a two story addition was added with a J.C. Penney Department Store. 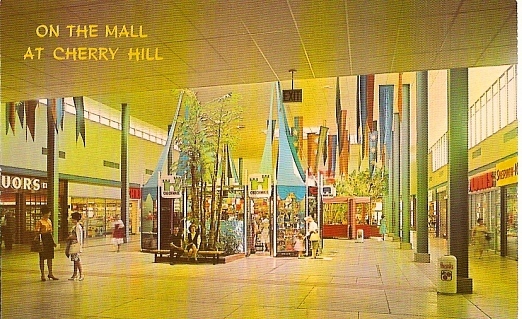 These photos of Cherry Hill Mall are from a set of postcards issued in the early 1960's. 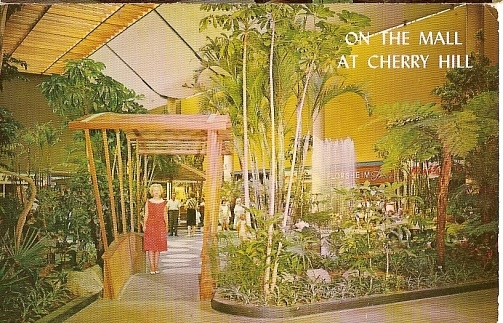 The scene above shows Cherry Court, which was the central court of the mall. 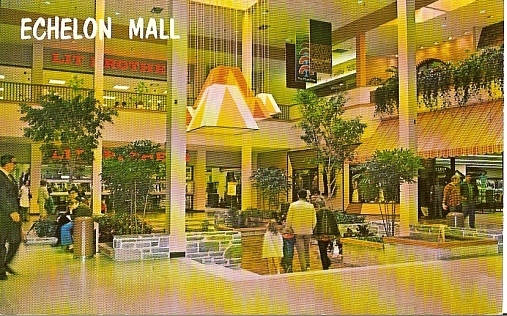 This wing of the mall, between Strawbridge & Clothier and Food Fair, was named Penn Mall. The top scene shows the bird cage and S.S. Kresge Variety Store and the photo below shows Market Court with Food Fair in the background. Thrift Drug can be seen on the left and HFC Loans and Sherwin-Willams Paints on the right. 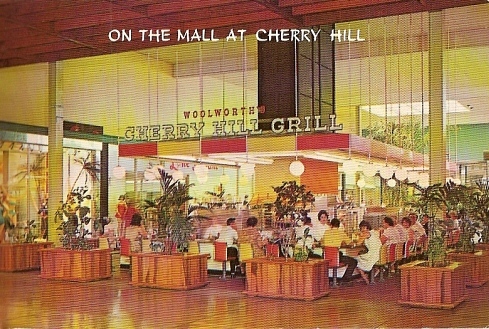 The Cherry Hill Grill was on the mall between Strawbridge & Clothier and Woolworth's. 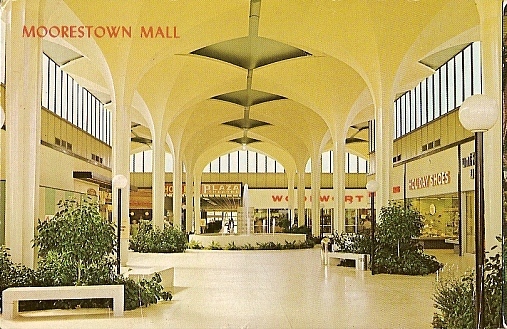 This wing of the mall was called Delaware Mall. A view of the Delaware Mall wing showing Harvest House Cafeteria and Woolworth's. 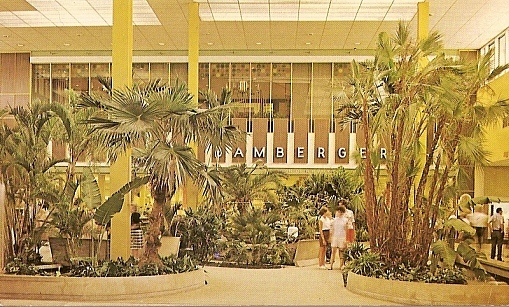 The Deleware Mall wing ended at the Court Of The Islands and Bamberger's Department Store. 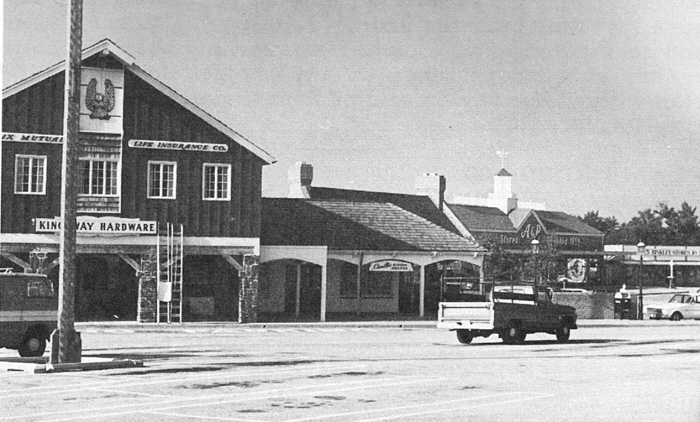 The second enclosed mall came to the area in 1963 with the opening of Moorestown Mall at Route 38 and Lenola Road. Original anchors were John Wanamaker and Gimbels Department stores, Shop Rite Market and F. W. Woolworth Variety Store. The scene below shows the main central court. One of the features of Moorestown Mall was a stream that ran down the center of the mall with live ducks. 1960's photo of Barclay Center on Route 70 in Cherry Hill. Shown are Kingsway Hardware, A&P Food Store and Binkley's 5 & 10. 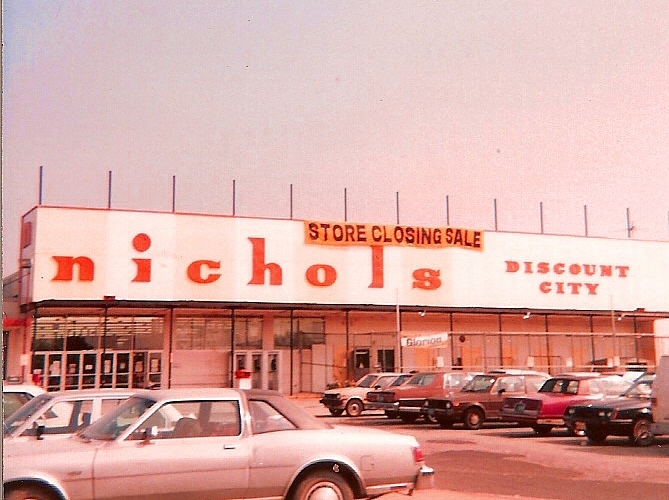 The S. E. Nichols store on Route 38 & 73 in Maple Shade shown at its closing in 1985. 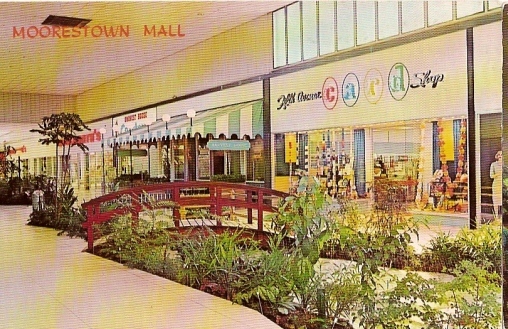 The opening of Echelon Mall in 1970 brought a third mall to the area. This mall has been reduced in size and is now called Voorhees Town center. 1930's photo of the Sears Department Store on Admiral Wilson Boulevard in Camden. 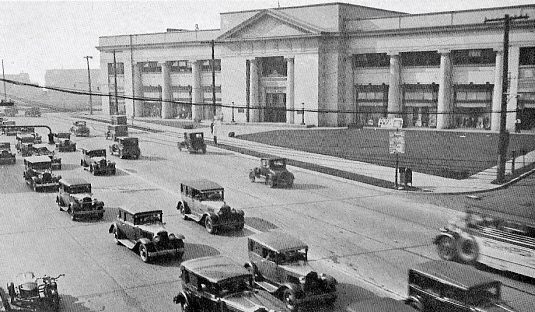 Was the first Sears store with its own parking lot when opened on July 1, 1927. Moved in 1971 to a new store at Moorestown Mall. Images on this page are from collection of site creator, John S. Flack, Jr.